Integration among all UQU scientific-research bodies. Motivation of serious researches production. Provision of a research environment for distinguished competencies. Development of indicators to measure and evaluate the research activity and participation in future planning. Achievement of an appropriate amount of financial resources for scientific research. Development of administrative organization and executive supportive scientific research rules so as to achieve efficiency and effectiveness. Encouragement of research in domains that correspond to national needs. Quantity and quality increase in scientific publication and production of knowledge, and quality improvement thereof. 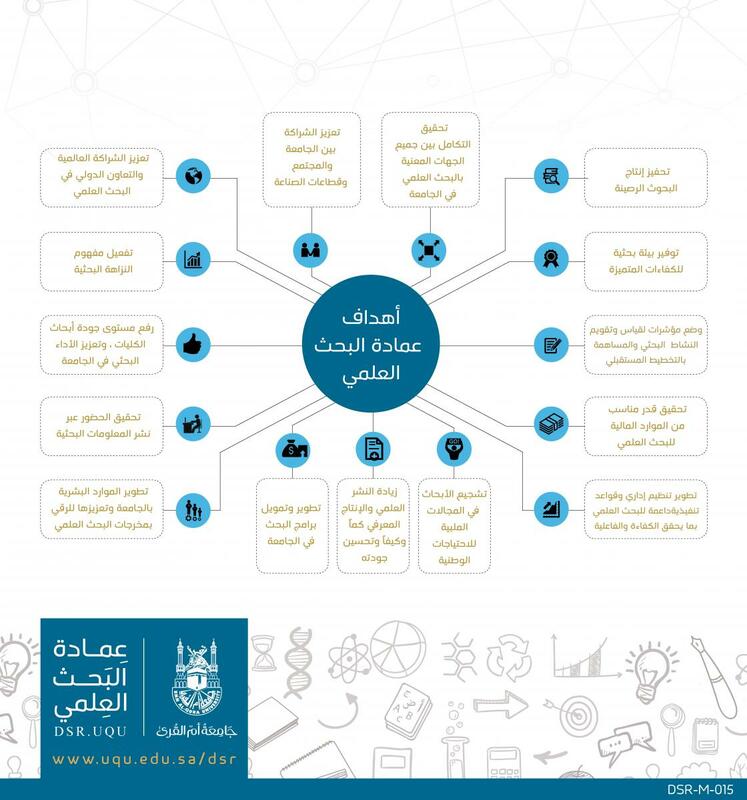 Developing and funding UQU research programs. Development and promotion of UQU human resources for the betterment of scientific research output. Achievement of presence through the publication of research information. Raising the quality of college research and reinforcing research performance at the university. Effectiveness of Research Anti-Plagiarism concept. Reinforcement of global partnership and international cooperation in scientific research. Reinforcement of partnership among UQU, society and industrial sectors.